I recently met Robert, who shared a home with a caregiver but was home alone most of the day. He wasn’t taking his blood sugar regularly due to some vision problems related to diabetic retinopathy. 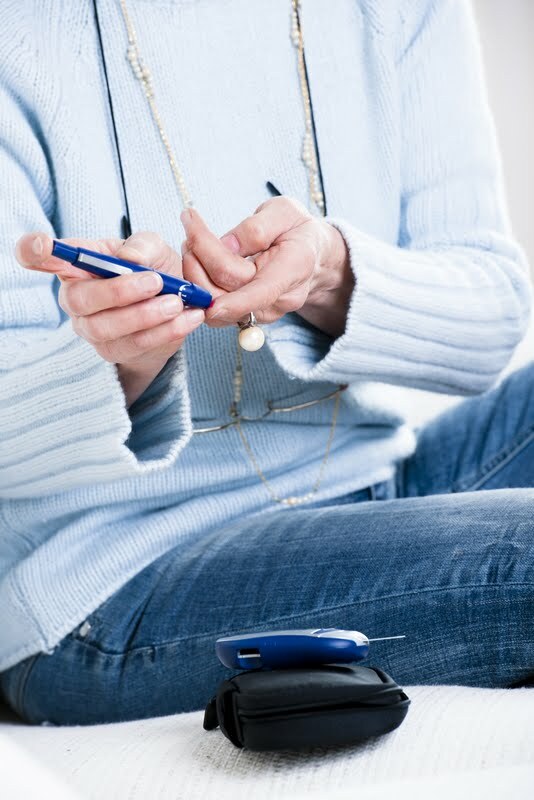 Monitoring your own blood sugars can involve a number of tasks requiring good fine motor skills and vision. You need to load lancets, stick your finger, see that there’s an adequate drop of blood, put the test strip into the blood droplet, read the numbers on the meter, dial the correct units of insulin and inject the insulin. 1. A lighted task magnifier was purchased that he could either wear around his neck with a prop to hold it away from his chest or to stand it up on the table. The cost was approximately $13. 2. He was educated to hold his hand down and squeeze his finger tip a few times before sticking with the lancet. He could then hold his finger under the magnifier to see if he had enough blood, continuing to squeeze as needed. 3. He then held the test strip under the magnifier as well to pick up the blood droplet. 4. His meter had large numbers, so he could read them quite well, but he was also educated about the talking blood-glucose monitors available, which feature a voice reading the numbers. 5. He used a scale written with a bold black marker on heavy white paper to determine the units. 6. He held his pen under the magnifier again to dial the correct number of units for his insulin. Being able to monitor his own blood sugar has kept him out of the hospital and feeling great!